Instagram's updated terms of service panicked its users, prompting the company to backtrack. One day after Instagram sent its users into a panic with a rule change that would have allowed it to sell users' photos to advertisers, the company backtracked, saying that sweeping change wasn't what it intended. "We've heard loud and clear that many users are confused and upset about what the changes mean," Instagram wrote in a blog post on Tuesday afternoon. "We're going to modify specific parts of the terms to make it more clear what will happen with your photos." That's an overstatement, Instagram said Tuesday. "To be clear: It is not our intention to sell your photos," the company said. "We are working on updated language in the terms to make sure this is clear." Instagram said its goal is to "experiment with innovative advertising that feels appropriate on Instagram." Facebook (FB) finalized its acquisition of Instagram three months ago, but has allowed the service to continue operating fairly independently. Instagram has never before carried ads -- or generated any real revenue at all -- but that situation wasn't intended to last forever, the company said in its blog post. "From the start, Instagram was created to become a business," it wrote. So what will be done with your Instagram photos? 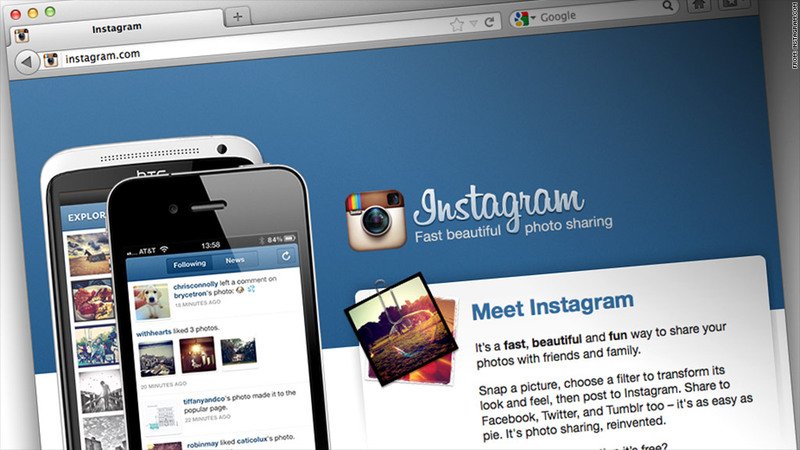 Instagram gave fairly few specifics, and emphasized that its plans are still being formed. It offered one hypothetical: If a business wanted to promote its Instagram account, and you "follow" the business, the site might use your profile photo in a message telling your friends about your endorsement. That's similar to an advertising product Facebook currently offers called "Sponsored Stories," that incorporates users' Facebook "like" votes. It led to a class-action lawsuit; Facebook is currently negotiating to settle the case. In the meantime, Facebook adjusted the controls for Sponsored Stories, allowing users to limit what gets shared. Users can't, however, opt out entirely. Something like Sponsored Stories appears to be what Instagram has in mind. The site won't sell your photos for use in corporate ads, it said. "We do not have plans for anything like this, and because of that we're going to remove the language that raised the question," Instagram wrote. Still, it's clear that the previously ad-free Instagram feed will soon be getting commercialized. "Our main goal is to avoid things likes advertising banners you see in other apps that would hurt the Instagram user experience," the site wrote. Instagram said it will revise its proposed new terms of service before they take effect next month: "Please stay tuned for updates coming soon."